As many as 54.4 million people in America suffer from poor access to healthy, affordable food, according to statistics from the United States Department of Agriculture. They define an area with a high level of poverty and a distance of at least a mile from a supermarket a ‘food desert’. 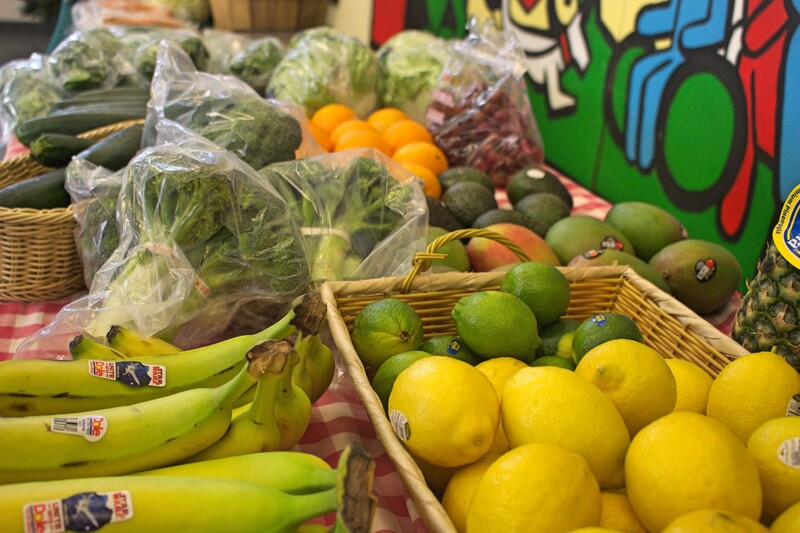 Lack of access to transportation often makes healthy food even more difficult to find. 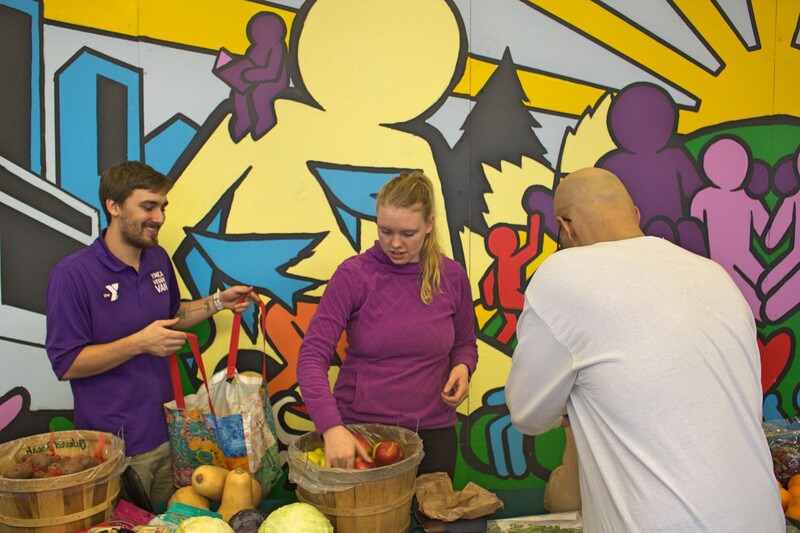 Portions of both Muskegon and Grand Rapids qualify as food deserts, but for many communities, the YMCA Veggie Van is filling the gap where fresh, affordable produce is hard to find. James Frugé, 52, lives at Herkimer Apartments on South Division, one of the Veggie Van’s weekly stops. His prosthetic leg can make it hard to walk long distances, and if it weren’t for the Veggie Van, he’d have to take the bus almost 6 miles to the 28th Street Aldi to get fresh fruits and vegetables. This week he bought a fresh pineapple from the Veggie Van to use in smoothies. “I’ve never got a real pineapple before,” he said. 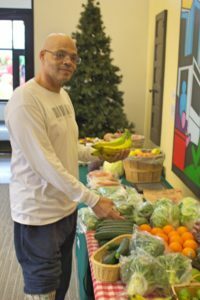 When communities are incapable of getting fresh fruits and vegetables, people instead rely on unhealthy packaged food from convenience stores and gas stations for their nutrition. You can explore what areas of West Michigan are potential food deserts with the USDA’s Food Access Research Atlas. One of the YMCA staff at the Herkimer Apartments stop, a Davenport University student named Austin Sirowatka, particularly enjoys the opportunity to bring new foods to downtown neighborhoods. “They’ll be like ‘hey, look at that stick’”, he said, but after some time, he says people often come back to buy the different fruits and vegetables to try a new recipe from the internet. This week, mango and pineapple were among the most exotic things on the table, but stock rotates from week to week because much of the food is locally sourced. Some of the Veggie Van’s grant funding requires them to buy local produce when they can. 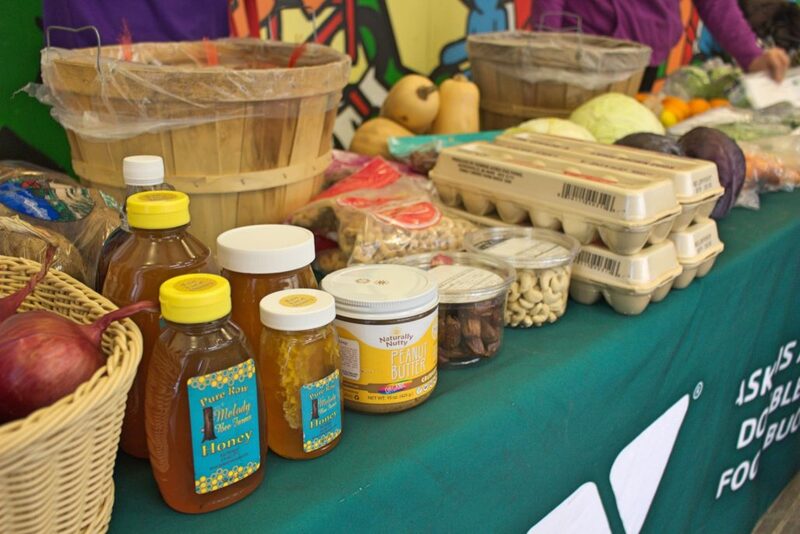 This week there were also apples, lemons, avocado, carrots, spinach, bananas, honey, eggs, cheese, assorted nuts and more. Cynthia Ferguson, another resident of Herkimer Apartments, buys food from the Veggie Van almost every week because she can’t drive due to a medical condition. She’s learning to take advantage of the Double-Up Food Bucks program, that doubles up to $20 of SNAP benefits in tokens spendable at the van’s market. The van accepts SNAP and FRESH benefits, and operates year-round unlike many local farmers markets that close in the cold months of winter. It’s funded by the W.K. Kellogg Foundation, Blue Cross Blue Shield of Michigan, Herman Miller Cares, the Muskegon Community Foundation and other grants and donors. “We truly couldn’t do this work without many different agencies in Grand Rapids and donors,” said Eugene Sueing, the community health director for the YMCA of Greater Grand Rapids and director of the Veggie Van program. He’s grateful for the continuing support the community has shown for the food availability program. The YMCA Veggie Vans stop at multiple locations around Grand Rapids and Muskegon during the week, setting up in the parking lots of local schools and apartment buildings to offer nearby residents access to food that would otherwise be out of reach. Times, locations and produce availability can be checked on the Grand Rapids YMCA website. The site also has information on how to apply to become a new stop for the Veggie Van. “The application is really what starts the relationship with a site and really gets us talking to figure out how we can make this work,” Sueing said. Most applicants aren’t turned down, but stops have to be evaluated for logistics and to make sure they would be in line with the program mission stated in funding requests. The Veggie Van also delivers fresh produce to convenience stores in the Healthy Corner Stores initiative to bring produce to low-access communities in a way that is available every day.